The page holds a variety of documents that may be of public interest. Documents found here may include ordinance information, copies of executive summaries for major cases of interests (officer-involved shootings, in-custody deaths, etc. 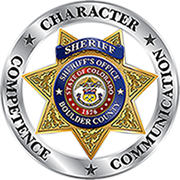 ), information about natural disasters that occur in Boulder County, and other notable documents of interest. Body camera footage of deputies helping a bear trapped in a vehicle. Taken on 4/16/18.